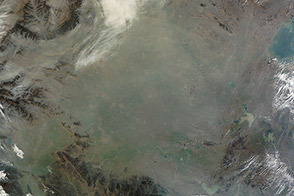 On the day this image was acquired, measurements from ground-based sensors at the U.S. Consulate in Beijing reported PM2.5 measurements of 334 micrograms per cubic meter of air. Fine, airborne particulate matter (PM) that is smaller than 2.5 microns (about one thirtieth the width of a human hair) is considered dangerous because it is small enough to enter the passages of the human lungs. Most PM2.5 aerosol particles come from the burning of fossil fuels and biomass (wood fires and agricultural burning). The World Health Organization considers PM2.5 to be safe when it is below 25. 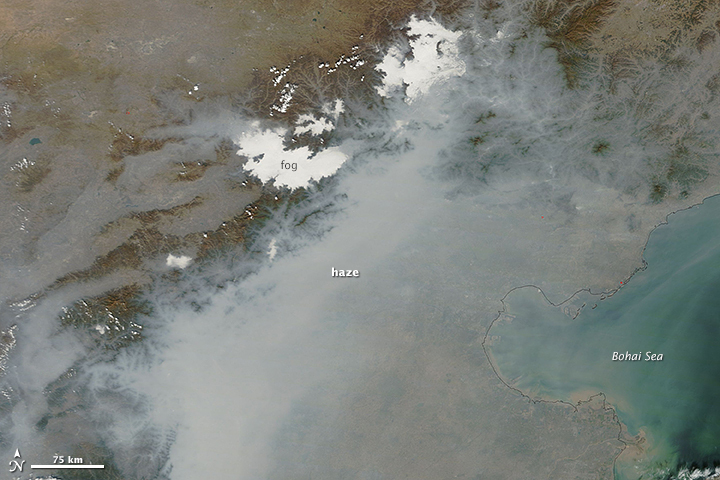 Haze in this region tends to worsen in the fall and winter, when cold, heavy air traps pollutants near the surface. 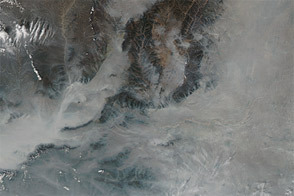 In this case, the haze was likely trapped by a temperature inversion. Normally, air is warmest near the surface of the Earth. Occasionally, a mass of warm air will move over cooler air so that the atmosphere actually warms with altitude. Since the cool air does not have the energy to rise through the warm air, vertical circulation slows and air becomes trapped near the surface. Any pollutant that enters the air gets trapped as well, and haze builds up over time. NASA Earth Observatory (2014, June 24) A Clearer View of Hazy Skies. 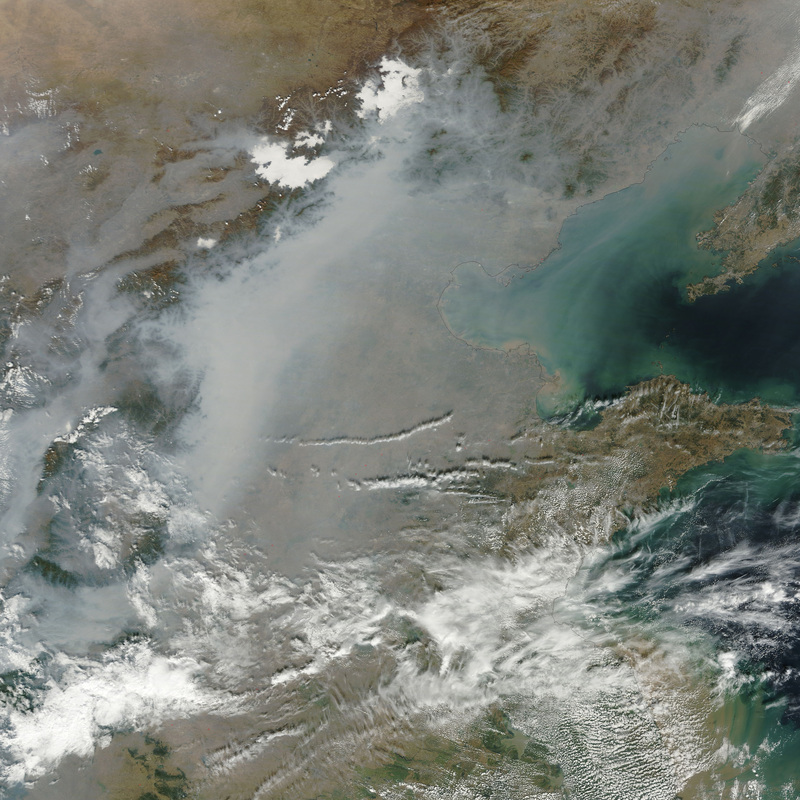 Remote Sensing Provides a Global Perspective on Pollution in the Atmosphere. China Air Daily (2014, October 9) Beijing: October 9, 2014. Accessed October 9, 2014. 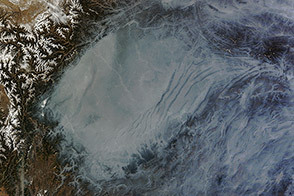 Pollution far exceeding World Health Organization standards blanketed the North China Plain in October 2014. Air Quality in China (2014, October 9) Beijing Air Pollution: Real-time Air Quality Index (AQI). Accessed October 9, 2014. 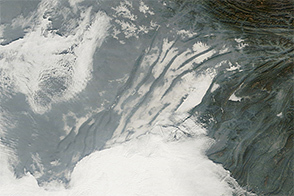 Bloomberg Businessweek (2014, October 8) Pollution Far Exceeding WHO Limits Settles Over Northern China. Accessed October 9, 2014. U.S. Department of State (2014, October 9) Beijing PM2.5. Accessed October 9, 2014. 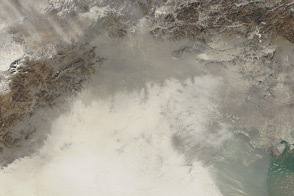 Xinhuanet (2014, October 9) Heavy smog shrouds Beijing. Accessed October 9, 2014.